Our informal Weekender KAL is underway! Anne and I are knitting “The Weekender,” by Andrea Mowry, and invite you all to join us, casting on and working at your own pace. It’s been just over a week, and we’ve both cast on, worked the bottom hems, and begun knitting the body of the sweater. I’m working with Kelbourne Woolens Scout in “Sunflower Heather,” a sunny stretch for this blue- and gray-loving knitter. Mowry calls for a tubular cast-on, which makes a tidy, rounded edge on the 1×1 ribbed hem. 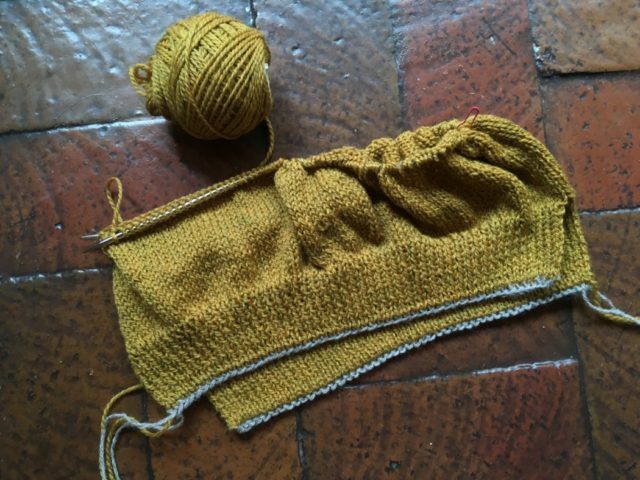 As in all of knitting, there are many different ways to make a tubular cast-on, and I substituted my favorite method for the one in the pattern. It’s one I encountered in my “Stasis” and “Docklight” sweaters, and the instructions come from Brooklyn Tweed. Anne used the same tubular cast-on, but modified the split hem so the front and back are the same length, as opposed to the longer back hem shown in the pattern. 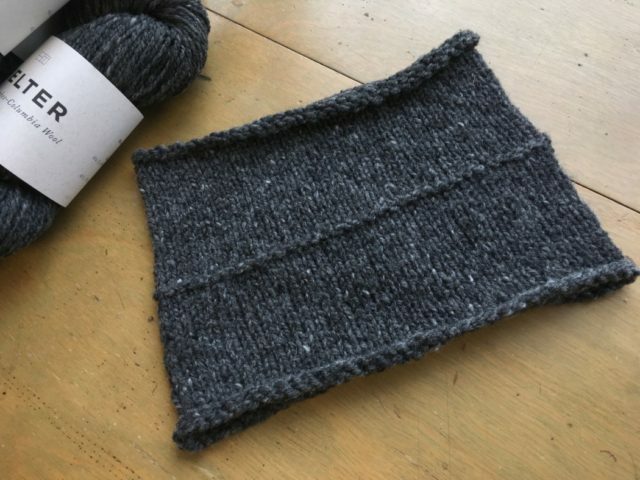 She’s working with Brooklyn Tweed Shelter in “Soot,” a heathered gray that is right in line with Anne’s favorite and most-worn colors. We are both loving the ease of this pattern, just cruising through the body, mindlessly knitting stockinette in the round, pausing only for the slip stitch at the center back and center front of the sweater. Sometimes simple is just right, and it seems the simplicity of “The Weekender” has landed at just the right time for each of us! Are you knitting along with us? 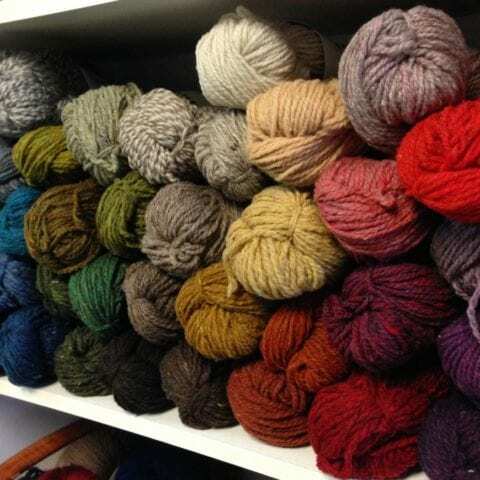 What yarn are you using, in what color, and how are you liking the experience? Let us know in the comments, or on Instagram with the hashtag #hysweekenderkal ! 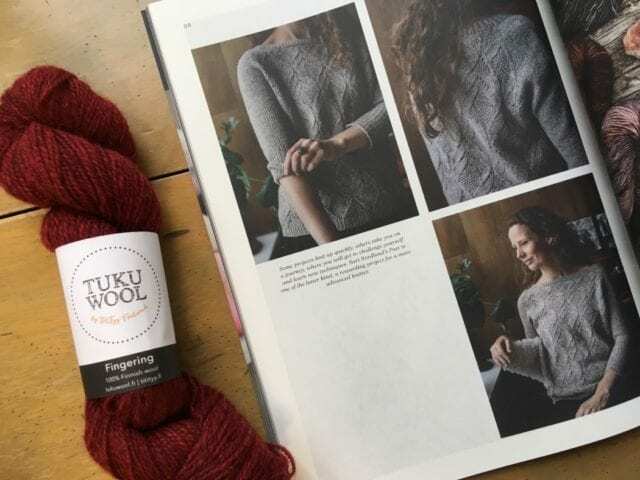 As you may have read in our most recent email newsletter, Anne and I have fallen in love with Andrea Mowry’s “The Weekender.” It’s been a popular pattern since it came out in late 2017, but somehow neither of us was compelled to cast on for it until recently. Maybe it’s because we’ve seen so many knitters make it successfully, maybe it’s because Shelter is the one Brooklyn Tweed yarn Anne hasn’t knit with yet, maybe it’s because my “Ursula Cardigan” is taking forever and I crave a simpler project. No matter the reason, we’re excited to announce an informal knit-along! How to participate? 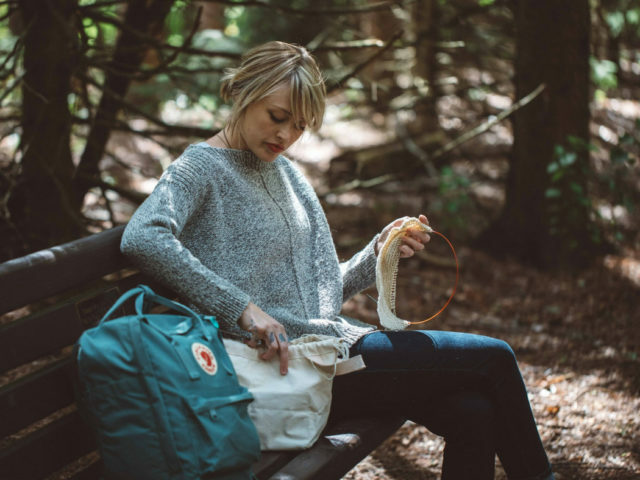 Simply cast on for your own “Weekender” and knit at your own pace. There will be no deadline, just the camaraderie of working from the same pattern at the same time. Anne and I are here to answer questions as you select your yarn, needles, and what size you’ll knit, and will post our progress along the way. 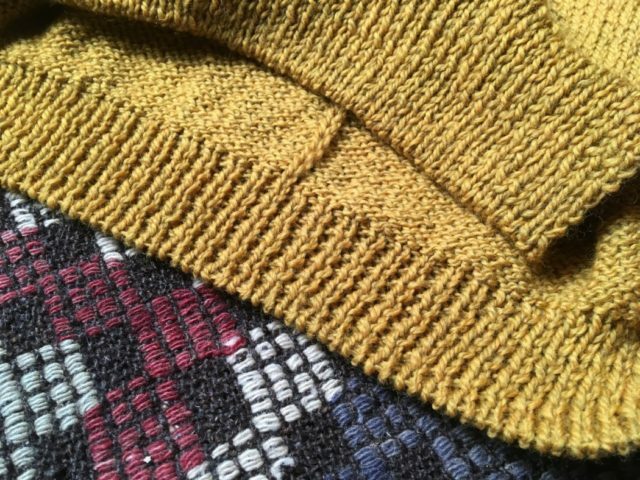 So far, we’ve gotten as far as swatching. 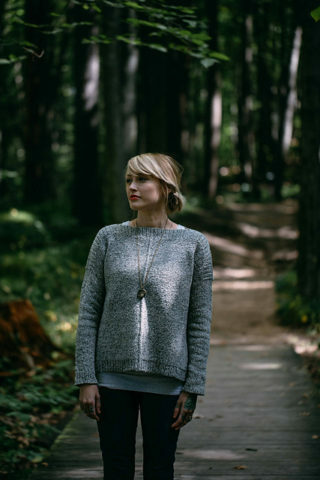 Mowry has cleverly designed the body of this sweater to be knit in the round with the wrong side facing, so you can peacefully knit in stockinette, then turn your work inside out for a reverse stockinette fabric. Because the sweater is knit in the round, it’s important to swatch in the round. 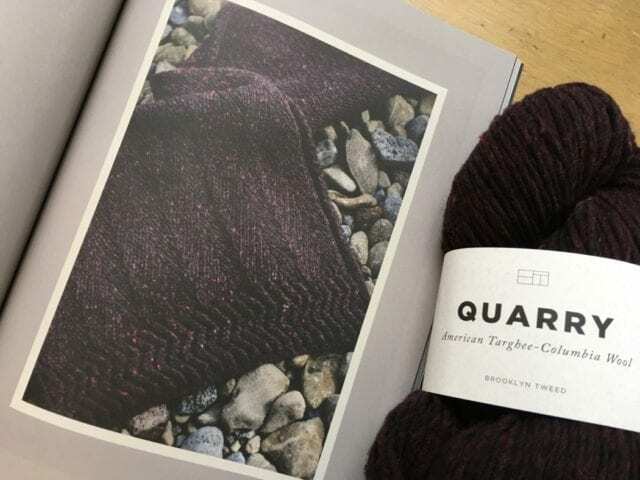 Anne is knitting with the recommended yarn, Brooklyn Tweed Shelter, a worsted weight, woolen spun wool that is lightweight and spongey, excellent for sweater-making. 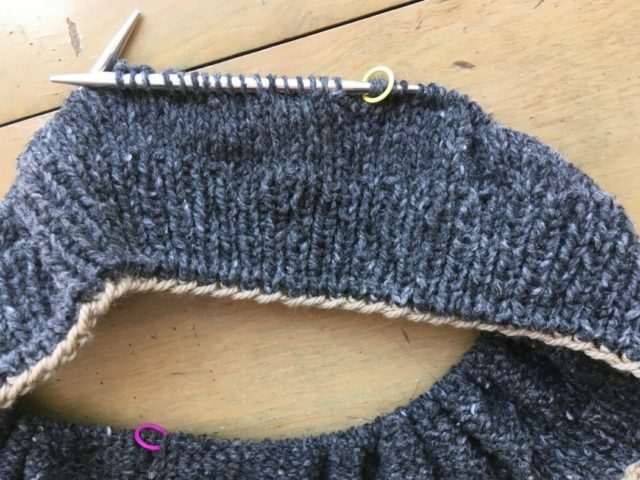 Mowry calls for 4.5 stitches per inch in stockinette stitch in the round, so Anne cast on as many stitches as it took to fill her 16″ circular needles for a real, honest-to-goodness sense of her gauge and fabric. Before blocking, it was looking like she’d get gauge on US 10 needles, but after blocking, US 9 needles turned out to be right on. 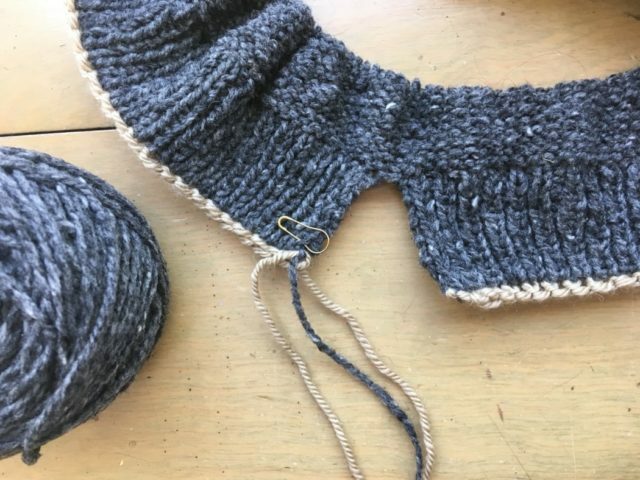 I’m following the lead of a few projects I found on Ravelry and knitting “The Weekender” with Kelbourne Woolens Scout, a robust DK weight wool that I’ve been anxious to get on my needles. 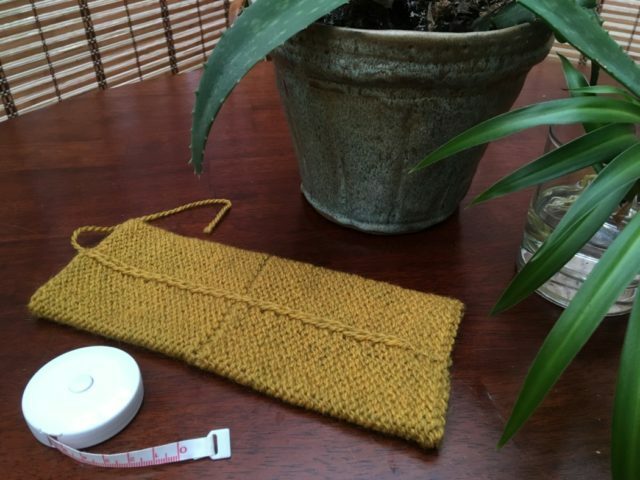 I knit my swatch in the round on DPNs, casting on for about 8″ of fabric, and was surprised and delighted to get stitch and row gauge on US 7. My “Weekender” will be somewhat more loosely-knit than Anne’s, and I’m excited to see how it turns out. We both plan to knit the 44″ size, which will give us several inches of positive ease, but less than the 10″ Mowry suggests – Anne and I both prefer more close-fitting sweaters and this will already be a few more inches of ease than we normally knit for ourselves. Have you been thinking about making “The Weekender,” or wanting a simple sweater that’s as effortless to wear as a sweatshirt? Cast on with us this week, or next week, or whenever suits you – knit along with us at your own pace, and come by the shop any time to ask questions and share your progress! 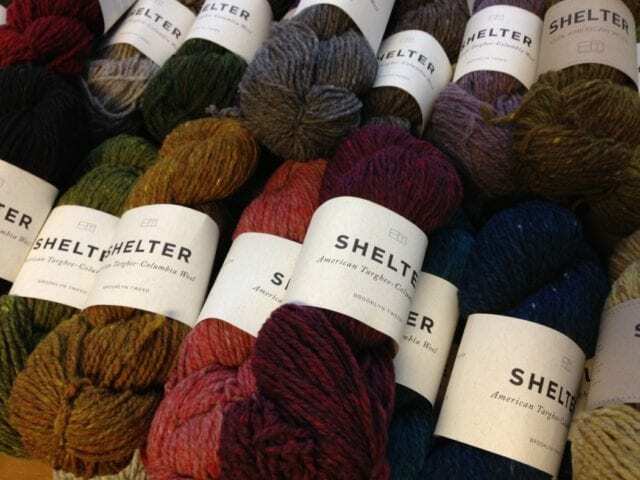 Brooklyn Tweed just came out with two new marled colorways in Shelter, just to complicate your color selection process – more on that soon! 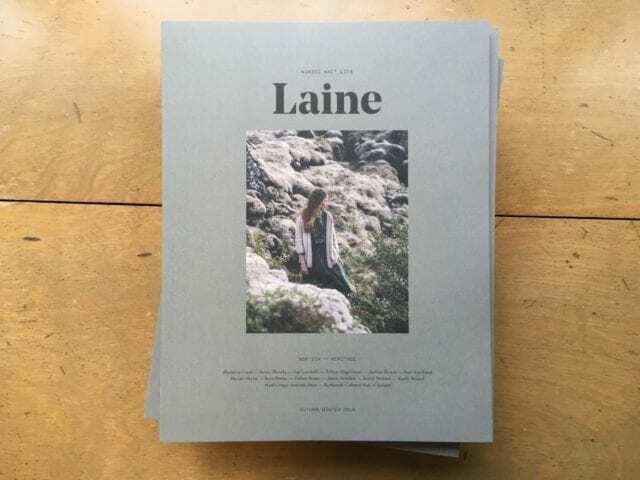 Last week, we welcomed another beautiful new issue of Laine Magazine. 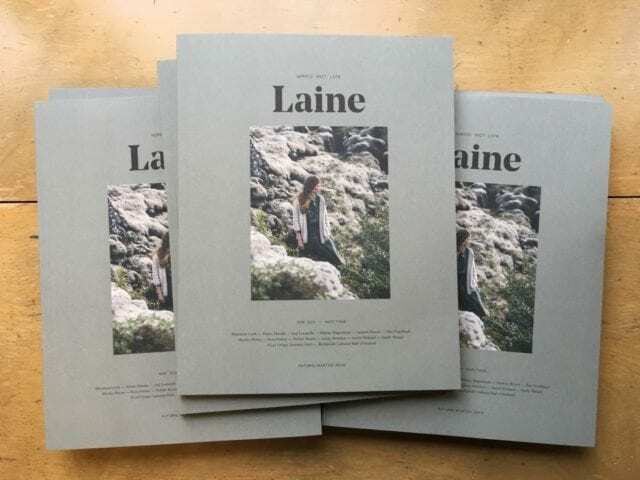 Laine Magazine is a publication out of Finland, a knitting and lifestyle magazine with a love of natural fibers and handicraft as its focus. It’s only a couple of years old, but it already has quite a following, and a reputation for beautiful designs and tantalizing photography. 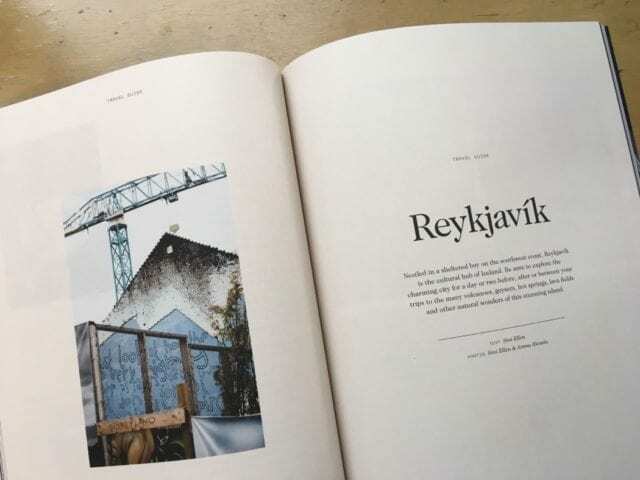 Inside this issue of Laine, you’ll find a mix of knitting patterns, articles, recipes, profiles on fiber artists, and a travel guide to Reykjavik. 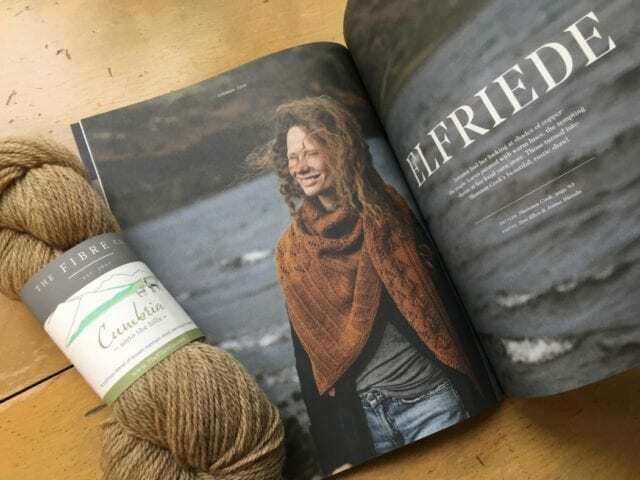 There are lots of familiar names sprinkled throughout this issue, like Andrea Mowry, Tukuwool, Shannon Cook, Brooklyn Tweed, Nancy Marchant, and Fibre Company, but we love getting to know new designers and yarn companies through Laine, too. 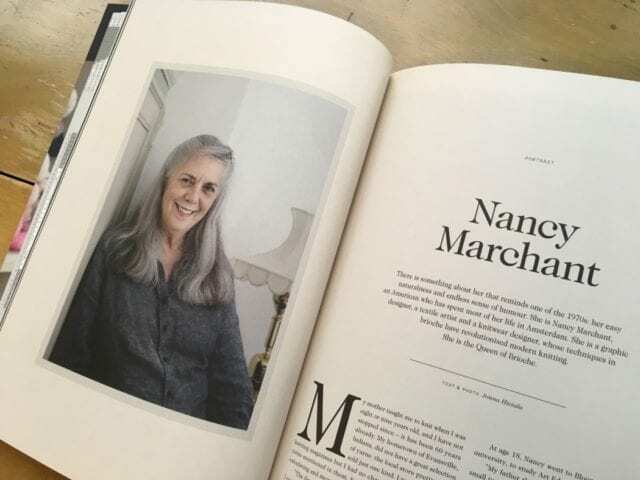 Come by the shop to page through Laine and our other books and magazines. We hope you find inspiration here!